There were three at the first meeting held in the home of John Millais’s parents in 1848: John Everett Millais, Dante Gabriel Rossetti and William Holman Hunt. Humble beginnings for the Pre-Raphaelite Brotherhood that would soon expand to include other kindred spirits who shared their intent on transforming the art world. The Brotherhood had four declarations, which were articulated by Dante Rossetti’s brother, poet William Michael Rossetti. The Pre-Raphaelites recognized the Annunciation as a profound event, but their interpretations were unique and in keeping with their four ideals. This vibrant composition by Edward Burne-Jones was completed over a four-year period beginning in 1857. The Pre-Raphaelites were famous for their stellar models. In this painting, some believe Jane Morris was the face of Mary, but others believe that it was most likely his fiancée, Georgiana Macdonald. 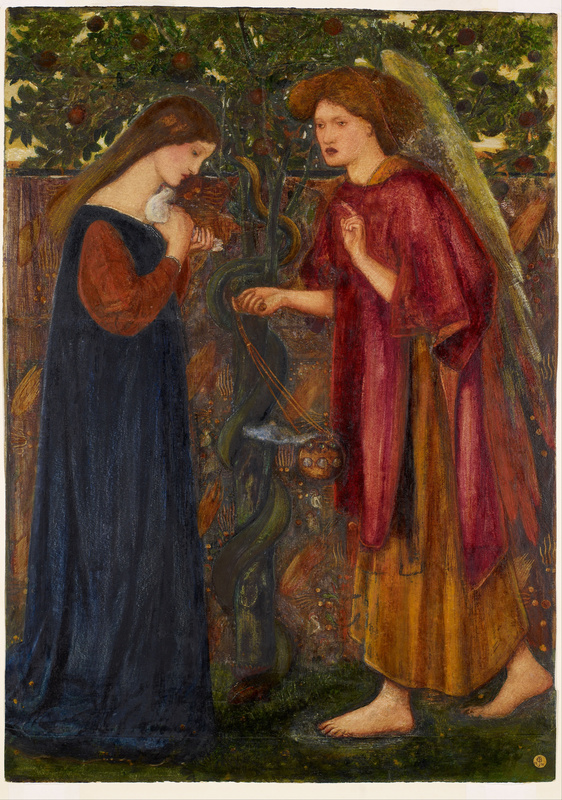 This painting is at the Birmingham Museum & Art Gallery which holds the largest public collection of Edward Burne-Jones. Dante Gabriel Rossetti was inspired by the works of Fra Angelico and Botticelli. Even so, he represented a new generation of artists who had fresh views. 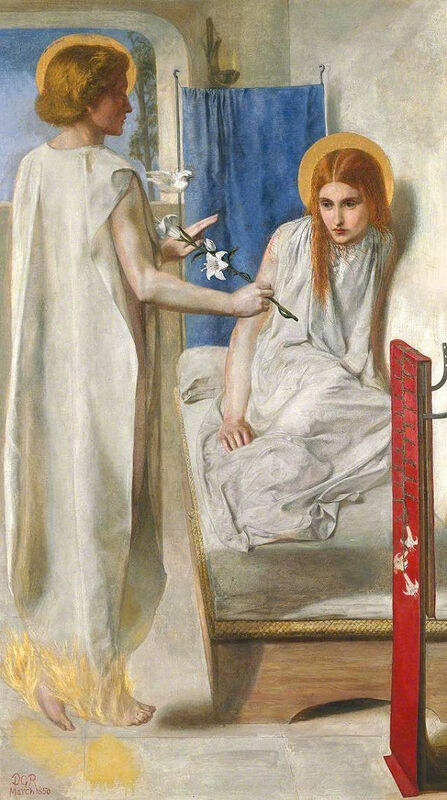 It does not come as any surprise that Dante Rossetti chose to have a more revolutionary interpretation that presents Mary as being awakened from sleep, with a look of bemusement. The angel Gabriel’s face is turned away from the viewer. Both figures are in white, with a blue curtain in the background and red post in the foreground. Again, the models were chosen carefully. He used his sister, Christina, for Mary and his brother, William Michael, for the angel Gabriel. This painting is held in the Tate Britain. Most people know John William Waterhouse as the artist who painted the famous “The Lady of Shalott (1888). A late-comer to the Pre-Raphaelite movement, he was born in 1849 in the city of Rome, around the time when the three artists formed the Pre-Raphaelite Brotherhood. 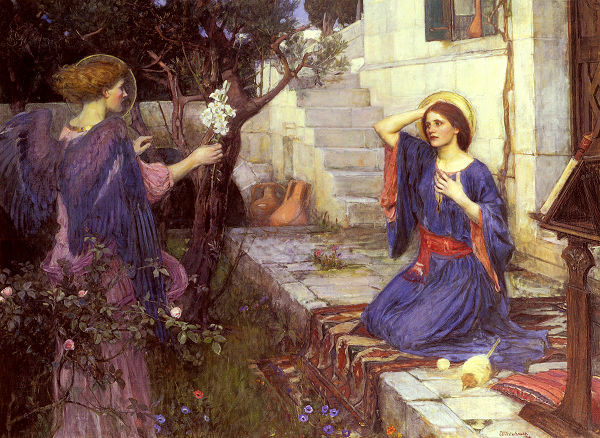 John William Waterhouse’s interpretation of the Annunciation, in a garden with rich carpets and terracotta vessels, reflect his love for Greek mythology and the Arthurian legend. This painting is held in a private collection. Thank you for this wonderful, educational, and inspiring post. I especially appreciated your mention of the “four declarations” by the Brotherhood. How we should aspire to those ideas in our lives–very challenging. The paintings are beautiful, and their history so interesting. One could spent hours looking and exploring the facial expressions, the beautiful surroundings. I am so happy for this post, it is so well thought-out and inspiring. I will be viewing it many times. Thank you, multiple times. I am delighted that you enjoyed this post. I try to imagine the first meeting of the three young artists who dared to go into the unknown, to challenge the status quo, to commit to a life-long journey based on their four ideals. They changed their world and in so doing, transformed the way we look at creativity today. May we be inspired to have courage to step into the unknown. Thank you for this brilliant overview of John Everest Millais! Looking forward to our ongoing discussion in 2019. And a happy 2019 for you! Yes, absolutely – we can learn from this approach – tradition building upon tradition. I think of how artists have encouraged us in this journey. Dante Rossetti built upon the work of Fra Angelico and Botticelli, giving new life to an enduring narrative. Carlo Crivelli added a third person while every artist created a location far removed from the original scene. As I listened to Steve read the Christmas Carol, I was reminded that we must join artists, writers, poets by giving voice to our traditions. Only then can we avoid ‘fossilization.’ I am looking forward to a fresh new year of exploration. By the way, you were so very, very lucky to work next door to Tate Britain. Hugs. Looking forward to plenty more exploration together – I love our shared adventures! That sounds like a wonderful idea. I didn’t realise until a few weeks ago that the traditional Carol service is only a 100 years old. We can and must keep creating traditions. What a beautiful trio of paintings, all different yet all comforting. I think that Rossetti’s interpretation is a very creative one, and it captures her innocence as well as bemusement, as you suggested. The wings of blue and purple in the final painting are soothing — and the dark tones on the left balance well with the light ones on the right. Well done for the artists, and well done for this post! I am so glad that you enjoyed this post. Following the story of the Annunciation through the many interpretations has been an extraordinary journey. I have discovered that artists allow us to experience a deeper understanding of the world around us, to explain without words, the significance of participating in the time that has been given. Artists recognize the possibilities of the now, engaging with the past and pointing the light on the path ahead. Thank you for creating a space that encourages this exploration. I look forward to our ongoing conversation in 2019.